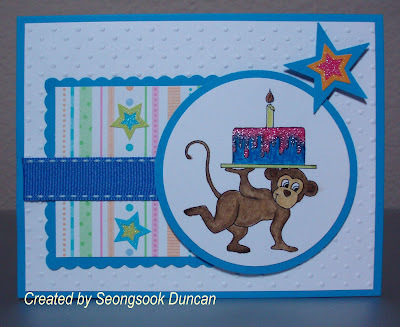 For a few days of holidays, I enjoyed playing with challenges that gave me a lot of inspiration for making cards for heroes in the near future such as Love, Birthday and Thinking of You cards. These are going to be perfect sample cards for my Card Making Club at work. Great! Thanks very much! What a fantastic card, love the colours, and this image is to die for! Love your card! The embossing and papers are fabulous. Great layout and I love the sparkle on the icing and the star! Great work! Thanks for joining in with us at TMITA this week! Such a fun card! I love the icing on the cake, and the patterned paper you used. I've got to go finish up my Valentines for heroes now! Whenever you need a sketch, come play at UnscriptedSketches.com We'll have a new sketch up on Saturday! Love everything about this card!!! So cute and perfect for a boy! Thanks for playing along with us this week at TMITA/PCC and hope to see you back nest week too! Oh My! This is super cute, bright and cheery and just fun and perfect for a boy's birthday! I love the design of this card as well! I especially love the star!! Hope to see you next week! Thanks for playing along with our challenge this week over at TMITA/PCC!